CALLUM PATERSON sent Hearts fans into dreamland as his header earned their side victory in the first Edinburgh derby of the season. The Jambos had been written off in some quarters before a ball had even been kicked this season after a summer of administration and cuts to the playing staff, not to mention the 15-point deduction they were served with as a result of their financial woes. 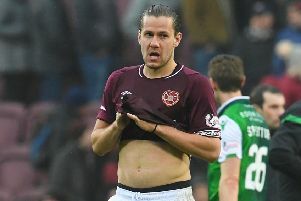 But their young side battled for everything against Hibs at Tynecastle today and snatched all three points – reducing their deficit on their rivals to just 12 points – after Paterson converted Dylan McGowan’s cross with 19 minutes remaining. Hearts manager Gary Locke had feared that Dale Carrick would be ruled out of the derby altogether with a knee injury but the young striker was fit enough to be named on the bench. And Hibs had Rowan Vine in their starting line-up after the new signing missed the opening game of the SPFL season against Motherwell last week through suspension. The home side suffered a major blow after seven minutes when Ryan Stevenson went down injured. One of a few experienced players in the Hearts squad right now, Stevenson was determined to stay on the pitch. However, despite a few minutes of treatment, and then trying to run it off, he had to admit defeat in the 13th minute and was replaced by Jamie Walker. It all kicked off just before the half-hour when Jamie Hamill was left dazed in a 50/50 clash with Kevin Thomson and, while Hamill was lying flat-out on the pitch, Scott Robinson and Vine were squaring up to eachother after a challenge down the left side. That pair were booked and the Hearts fans breathed a sigh of relief as Hamill managed to continue after treatment. One of the only shots at goal in the first half came when Liam Craig teed-up Vine, who tried a long-range effort but Jamie MacDonald did well to get down to smother at his left-hand side. Ten minutes before the break, David Smith was fouled by Robertson and Hamill stepped up to take the resultant free-kick. He may have been bruised and battered but he still managed to produce a powerful, low effort that left Ben Williams requiring two attempts to hold it. At the break, Hibs boss Pat Fenlon brought Ryan McGivern on to replace former Hearts defender Fraser Mullen. Just after the restart, Hibs could have snatched the lead when James Collins chested the ball down inside the box and turned to take the shot, only to pull his effort just wide of MacDonald’s left-hand post. There was a brilliant effort from Hamill just a couple of minutes later, the midfielder forcing Williams into a fingertip save right at the postage-stamp corner after unleashing a swerving long-range shot. The home support were screaming for a penalty with just over an hour gone when the ball appeared to strike the arm of Lewis Stevenson but referee Craig Thomson waved away their appeals. Hibs passed up the best chance of the match in 66 minutes when Collins picked out Craig down the left and the former St Johnstone player whipped a great ball into the box. It seemed certain that sub Tom Taiwo, who had just come on for Scott Robertson, would stab the ball beyond MacDonald but he was falling back all the time and could only send it high above the crossbar. And Hibs were left to rue that miss as Hearts stunned their opponents in 71 minutes when McGowan’s ball in from the right was glanced in by Paterson. It was a cracking header and Tynecastle erupted in celebration. Despite some late pressure from Hibs, the young Hearts side held out for a famous win which piles the pressure on Easter Road boss Fenlon, with two league defeats now following his side’s Europa League humilation by Malmo. Hearts: MacDonald, McGowan, McKay, Wilson, McHattie, Stevenson, Hamill, Holt, Robinson, Smith, Paterson. Subs: Ridgers, Walker, King, Tapping, Carrick, Nicholson, McGhee. Hibs: Williams, Mullen, Nelson, Hanlon, Stevenson, Tudur Jones, Thomson, Craig, Robertson, Vine, Collins. Subs: Murdoch, McGivern, Handling, Forster, Stanton, Caldwell, Taiwo.